There are several websites that invite readers to enter their events for the International Day of Peace (IDP), but it is difficult to get an overall view of what is happening. Let’s start with regular websites? The website http://internationaldayofpeace.org/ has a map of the world with symbols for different kinds of events. After considerable trial and error, since there is no explanation on the page, I was able to separate most of the entries for marches, music, meditation and multiple as of September 21. Here is what I found, separated by region of the world. This adds up to 328, while website gives a figure of 1369 events. In many cases one can obtain information about the event by clicking on the symbol. How about Facebook? As of September 21 the Facebook page #PeaceDay has dozens of entries every day beginning on September 10, but most of the entries do not indicate the country concerned. One of the entries #iplayforchange carries a map of 295 events in 51 countries. 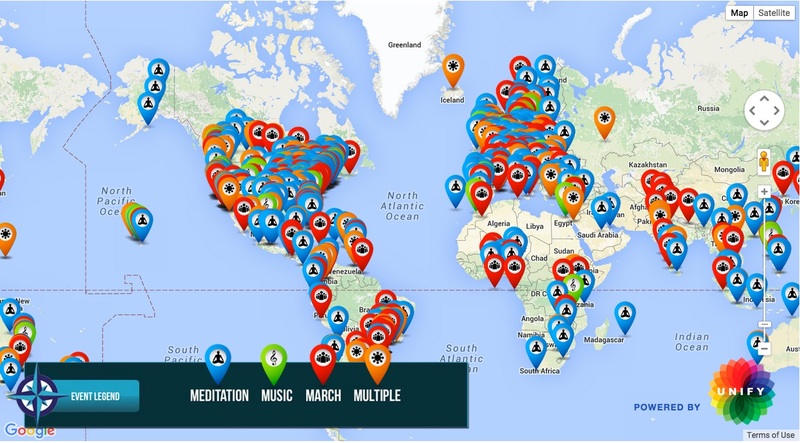 By clicking on the map you find photos from musicians around the world, but no detailed listing of the events. Another facebook page is https://www.facebook.com/events/461780550660626/, where today (September 21) one finds entries listed from Lebanon, Brazil, Canada, Australia, Korea, Philippines, Indonesia, United Kingdom, Argentina, Turkey, Libya, Luxembourg, etc., etc. I get the feeling from “surfing the internet” that the IDP is being celebrated around the world to a far greater extent than we can measure. Is it increasing from one year to another? Does it mark a growing anti-war consciousness? Unfortunately, I see no way to measure this from the available data. How are you celebrating peace day? Recurrent attention on the struggle for the commons, in our town and as a common themes in peoples; struggles around the world. Cette année la Journée internationale de la paix a Connue une Forte mobilisation dans le monde.